When is Mercury Retrograde Next? Mercury retrograde is actually not something to write in your date book in the hope that you will be reminded to catch all the mistakes, misspellings and mishaps before they wreak havoc. It’s not about avoidance. It’s a reminder that we humans need time to contemplate, to consider, to reflect and remember. Otherwise our mind overtakes our soul and we slip head first into a kind of oblivion of distraction, stress and confusion; states of being that are not desirable or necessary. Mercury will square Neptune and Mars (which will be conjunct each other) as well as conjunct Jupiter and the Sun which it always does when retrograde. It seems to me that this period is ‘introducing’ a new level of confusion which lasts into January at least as Jupiter will also, then square Neptune. We can practice with courage and persistence our ability to hold steady in the face of the chaos we all seem to be feeling: To slow down when we start to panic and consider what is really real. When Neptune gets involved there is a lot of confusion and delusion but there is also transcendence which isn’t so much about being above it all as being spacious and allowing for the inevitability of change. When Mars is involved we often feel impelled to act but Mars works best in Pisces when actions are based on true feeling which can only be known when we are relaxed and allow things to show themselves. The most important day of any Mercury retrograde period is the conjunction with the Sun which happens on November 27th at 5 degrees of Sagittarius, quite near the Jupiter Mars square. This conglomeration is active from November 26th – November 28th. Do not get carried off on a river of misinformation and meaningless details. Rather listen to the voice of reason and/or truth that can only be heard in stillness. Then, if you must, take action. You can read more about Mercury’s aspects at Insights for the Month. Here are the significant dates. Mercury square Neptune: At the time of the retrograde (November 16th) but this aspect is not exact which might be a good thing! A little less confusion. Mercury enters the shadow of the retrograde period (setting up the issues) around October 29th and leaves the shadow, thereby indicating a release of the issues after December 25th. 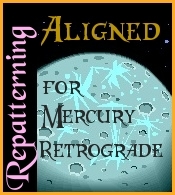 Resonate with being aligned with Mercury Retrograde and make the best of this energy! This entry was posted in General Comments and tagged aligned for mercury retrograde, mercury is retrograde November 16th, Mercury Retrograde, positive side of mercury retrograde, repatterning for mercury retrograde. Bookmark the permalink. We are keeping tabs on the trickster planet and creating coherence for moving through the retrogrades with grace and ease. It's not always easy as those stung by Mercury can atest. We hope the information you find here will help you to get the most out of Mercury Retrograde. Carolyn's Web Site “You can repattern anything” Visit this site for more details….